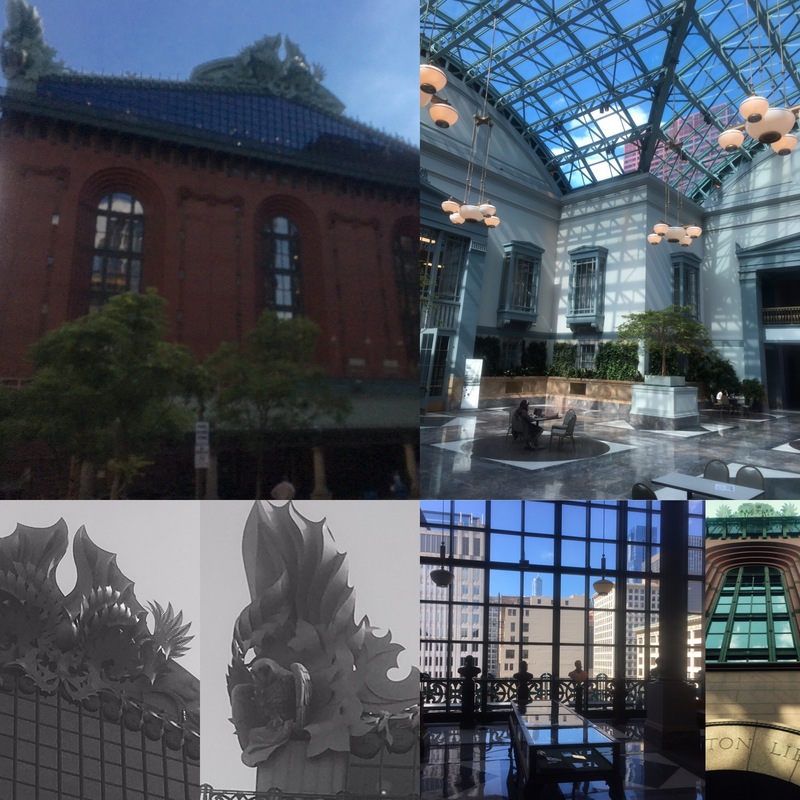 Several shots of the Harold Washington Public Library exterior. Those are owls at the corners. And a couple of the view from inside the reading room on the top level. It’s wonderful. A very nice place to take a break from the very busy downtown. Coming to you today from the laundry room in the basement of the University of Chicago. I’m here for a Gilder Lehrman program on Literature of the Jim Crow period which starts today. I’m doing laundry because C.J. and I decided to make a vacation of it so I’ve been here since Tuesday. I was very good up until yesterday–no bookstores. We even walked past several on our way too and from various sites and events, but I didn’t go in. Until yesterday. For the record we did over 17,000 steps every day, many of them stairs. One of those days was over 20,000! Today, my feet really hurt. 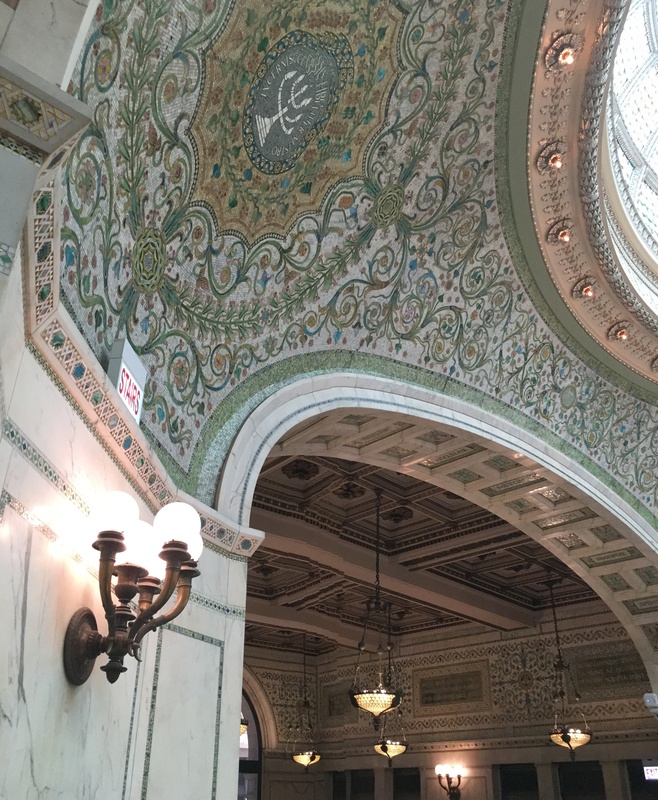 We did visit both of Chicago’s downtown libraries: the Harold Washington main branch and the old main branch which is now the Chicago Cultural Center. The one to visit if you’re ever in Chicago is the old one, for the spectacular interior architecture. It’s as though a gilded age robber-baron, or a group of them, spent big on glittery glass mosaic and stained glass. We visited many of the usual places including and can offer you this advice. Unless you have a child between the ages of nine and twelve in your party, you can avoid the Museum of Science and Industry. It is fun to tour the U-boat but the place is clearly designed for littler kids. Adults are better off sticking to the Field Museum of Natural History. Their dinosaurs rule. They’re almost as wonderful as their collections of North American Native lodge poles. The Chicago Art Institute is a must see but you can completely avoid the modern/contemporary sections. I do like that sort of art so I speak as a fan when I say the modern art collection at the Art Institute is the dullest one I have ever seen. Skip it. But do go to the Museum of Contemporary Art which is the cheapest of them all. It features rotating exhibits that have been interesting, fun and beautiful every time we’ve been to Chicago. This is a pastel from The Chicago Art Institute. This is Mme. Francious Buron by Jacques-Louis David. If you can enlarge it on your computer to see the detail, you’ll be very impressed. This is pastel! 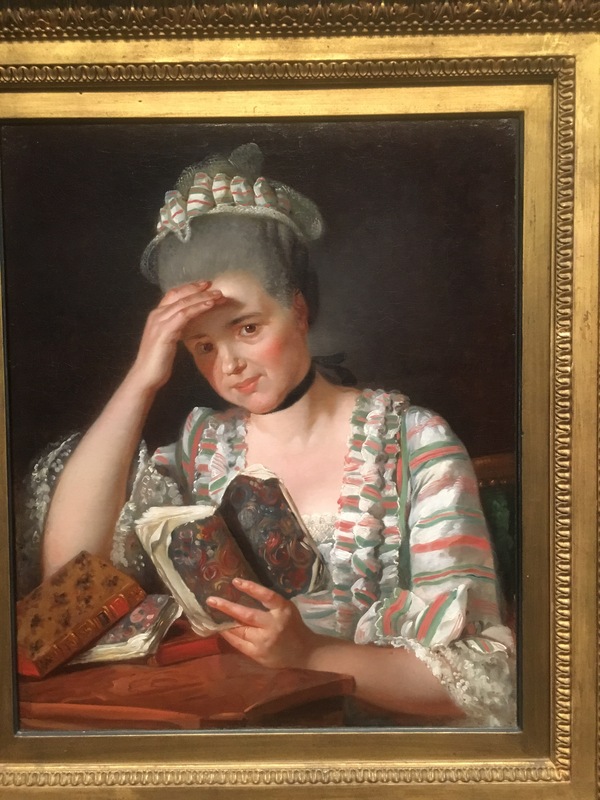 I picked it because she is reading, of course, but look how she has torn the book from its cover. One bookish site you may not know of is the Dreuhaus Museum just north of the loop. It’s a restored gilded age mansion with a nearly fully furnished first floor that features a very impressive library. It’s an incredibly house, well worth a visit. Yesterday afternoon, I gave in and went to Sandemeyer’s Bookstore which was a few blocks from our hotel. It’s a wonderful neighborhood bookshop with lots of titles I’d never heard of but had to have. However, the true test came when I asked the clerk for a book I read about but couldn’t remember the title of. All I knew is that is was a Scandinavian detective series with “Q” in the title and that one of the two main detectives was Muslim. Just about everyone in the shop laughed when they heard my request, but the clerks at Sandameyer’s were able to find the books, which they had in stock, in under three minutes. Turned out, one of the clerks had read the book which she highly recommended. C.J. said after that I had to buy one, so I did. I’d tell you the title, but I’ve forgotten it again. This is the P.G. 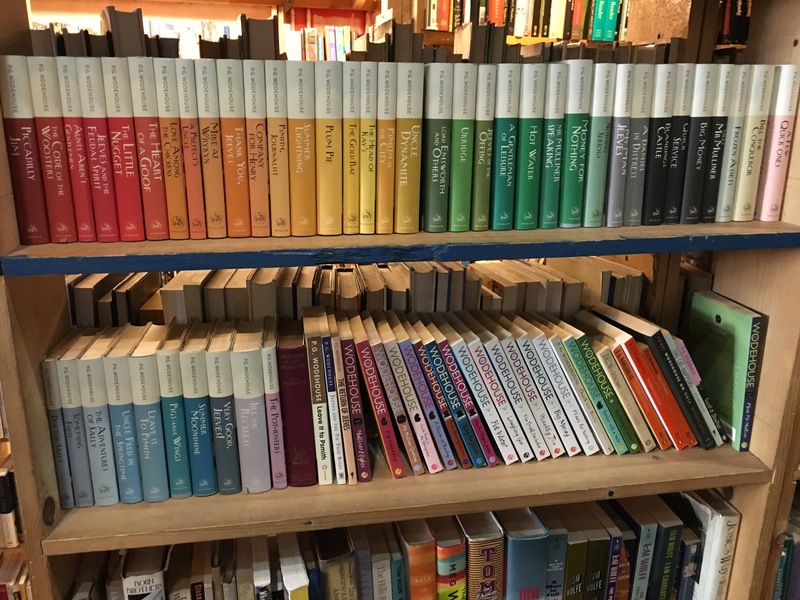 Wodehouse section at Myopic Books. Even with their slightly high prices, you have to love a bookstore with a P.G. Wodehouse section this big. On the way to the theatre last night we passed Myopic Books which is worth a trip to Wicker Park even if the prices are a bit high. I found the used prices in Chicago to be a bit high overall except at Selected Works which must be the coolest Chicago bookstore nobody knows about. It’s upstairs above The Artist’s Cafe on Michigan Ave. You have to ride a very old elevator, one that still has a human operator, to get to it. Stacked to the gills with very old books at very good prices. Today, after C.J. headed for the airport, I went to Powell’s Books Chicago which is excellent. It’s much bigger than first meets the eye. Something for everyone, almost everything priced at least two dollars more that it should be, in my opinion. But Powell’s seems to be expanding nationwide so they must know what they are doing. 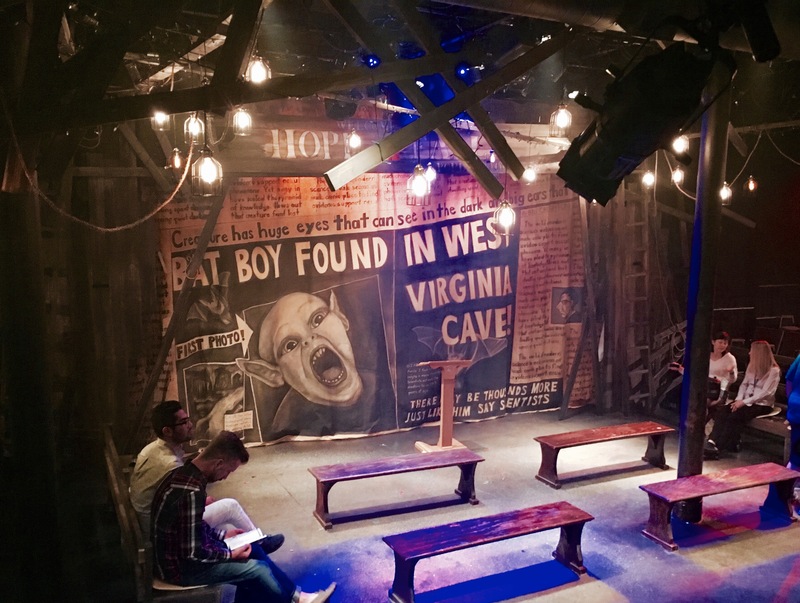 We were in the Wicker Park neighborhood to see a production of Bat Boy the Musical. We loved it. It’s very faithful to the spirit of the source material from the now-defunct Weekly World News, which both C.J. and I used to read. Before the show we had coffee at a place called Volumes, a coffee shop/bookstore which had five different books by Shusoku Endo on the shelves. If you’re a fan of his like I am, then you know just how rare an occurance that is. My final bookstore was 57th Street Books which is my favorite one. Just down the street from Salonica, where you can get an excellent breakfast at a terrific price, 57th Street books is just new books, but they have an unrivaled selection. At least an unrivaled selection of books I want to read. If I lived in Hyde Park I would be broke all them time because of this store. Apparently, it’s a co-op–I’ve no idea what that means, but I guess you can get a discount with a membership. My laundry is just about done, so I’ll have to sign-off and move things along to the dryer now. Should I visit any more Chicago bookstores, and I probably will, I’ll do another Sunday Salon post about them next week. Chicago is one of my favorite places to visit, but I have never come across any independent bookstores. Probably because I was too busy focusing on the touristy things. There are many good “touristy” things to see in Chicago. It’s a been a great vacation. Wonderful wander with you through this city. Enjoyed hearing about it. Thanks. “Should I visit”! – Seminary Coop! It’s two blocks from (& paired with) 57th St. Books, behind Robie House. It’s the greatest new book store in America. I’ll note that the Portland Powells actually splintered off of the Chicago Powells somehow, and they are currently completely unaffiliated. I did not know that about Powell’s. I thought they were a Portland original. I will try to make it to Seminary Coop before the end of the week. It may be my Saturday destination. I have a very full agenda for the class I’m taking. I am green, GREEN, with envy – so many bookstores in one city. You have no idea how fortunate you are to have such access. Thanks for sharing Chicago with us. Aaarg, now I have a serious case of Bookstore envy, and have just added Chicago to my (long!) list of “places to go for book-tourism” but it was lovely to discover it here! There were a couple of stores I didn’t make it to. The Seminary Coop Tom mentioned is well worth a visit, too. It’s a store for much more serious reading, but lots of fun to visit.